The change of over 5 parts per million from 2018 to 2019 is eye opening. The above chart and links show the Scripps full records. The charts below are from NOAA. 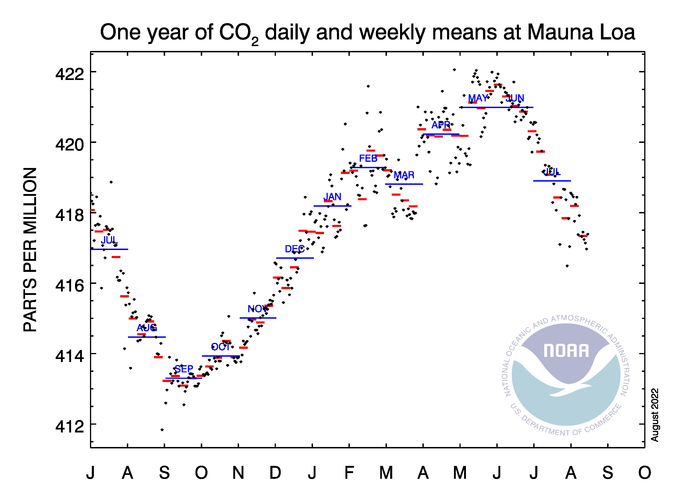 So, after this little carbon checkup we see an increase of anywhere from about 4-5 parts per million over last year. That’s a rise from what I usually see of 2-3 parts per million. Now I will briefly get on my soapbox. Is there any wonder why the old Climate Guy can read, at times, as so very pessimistic? My perception with green energy is that once it comes online it’s not conserved. An ever growing population around the planet continues to crave more electricity due to a very popular, high tech western lifestyle. I promised my readers that I am not going to proverbially throw in the towel until after 2019 is done, staying positive until the end of the year. I may live another 30 years, but I do not expect CO2 levels to go down. Hopefully and with some very hard work the rate of change from year to year will flatten, however. If I get a small glimmer of hope, which indicates that the Paris Accords and other measures will have a substantial effect, I hope to stay positive into the 2020s like some world famous climate scientists such as Dr. Michael Mann. Psychologically 2019 is going to be a wild ride for me in association with the climate issue. Well, get on board and see exactly how many twists and turns we encounter on this blog site. Let’s keep sane, though. The 'experts' who say the #GreenNewDeal will be 'too hard' or is 'unrealistic' probably haven't grappled with what's at stake. If we don't do what science demands ASAP, by the time we're their age, millions will have lost their lives or livelihoods.